Physical modeling currently is a big subject in engineering. One the one hand, it might be used for simulating mechanical or electronical behaviour of circuits to analyze such systems and optimize attached components to cooperate with such systems. Electronical circuits like e.g. PLCs which are often used to control electromechanical systems, can be tested with the HIL (hardware in the loop) concept, since they run in real time (up to a given speed limit). Various test cases and the behavior of the environment or the user are applied and the response of the system is simulated. Typically, HIL systems for real time simulation and emulation are created with micro processor units or digital signal processors but nowadays, FPGAs are ready to use for such applications too, since FPGAs perform basic calculations much quicker and the FPGAs can process many "tasks" parallel in real time. For example, a current DSP operating at 80MHz performs a classic 2nd order differential equation which describes a sinus oscillation in about 1us because it needs more than 100 clock cycles for RAM access, wait states, summation, multiplication and storing the three basic parameters position, speed and acceleration. For an appropriate real time operation, around 100 kHz of sample frequency are used to model a 10-20kHz bandwidth system correctly enough to simulate a regulator's behavior which is controlling this system. Only 10 such equations can be solved without exceeding the real time border. With a simple FPGA running at 20 MHz, one equation could be processed at the time, so many channels might be possible. There is only a latency of here 36 cycles, limiting the loop calculation which finally is not much slower than the above DSP system. So If a mechanical system requires 3 or more diff equations, the FPGA becomes quicker than the DSP solution. Next to virtual modeling, FPGAs are appropriate for most applications which require parallel processing. The more channels required the better is the FPGA. The technique of VA synthesis is a known concept for nowadays' music synthesizers which initially worked with electrical circuits. 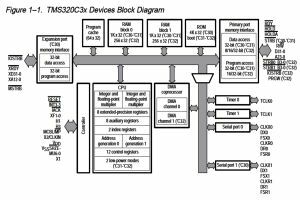 Since sound synthesis requires "only" 44100 samples per seconds to go with audio CD productions, DSP based devices appear suitable to generate all the required information for VCOs, LFOs, modulators, filters and modifiers to produce virtual analog sound. My first approach of a VA-Synthesizer was done in 1998 with a TMS320-System from Texas Instruments formerly used for video applications. Basic algorithms were introduced to generate some VCOs (which are NCOs in numerical systems of course), some LFOs and some filtering to tweak and manipulate the voices. The first synth on the TMS-platform had 32 voices with 2 Oscillators and 2 LFOs per channel, some global filtering, compressing and limiting. Oscillators were DDS like controlled from the outside. All operated in 16 bit in C language. Afterwards, algorithms had been transported to 24 bit being more compatible to the digital audio standard using Motorola's DSP 56301 digital signal processor. The system was simply doubled, having 64 voices now. Getting it more complex exceeded the operation speed, so the number of voices were reduced to 16 again, having 4 LFOs and 4 oscillators per channel, and some better filters instead. Filtering is essential for digital sound synthesis, otherwise it will sound boring. The big difference were the oscillators: Unlike with the TMS, all OSCs were self oscillating like a mechanical system with acceleration and damping parameters and a well defined energy loss. Rather than controlling the oscillator's phase from a pointer like with DDS circuits, the OCSs were fed by virtual energy increasing both phase and amplitude which leads to a more natural behavior. 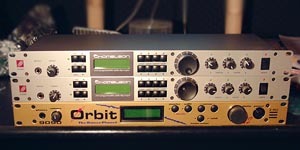 The DSP 56301 and it's successors are widely used in digital audio processing. See here for my recent stand platform of the Motorola EV 56302. This system was followed by the freely programmable DSP System "Chameleon" from Soundart Hot in 2004 because this comes already with audio compatible hardware like ADCs, DACs, rotary Controller and a programmable display. The Chameleon perfectly meets the requirements of sound creation, mixing and mastering studio. They have 19inches rack size and pre defined structures for both real time operation and ASM based sound processing on low level. Since the system is though limited and will first be extended in the forthcoming version, announced for next year, there had been some need of a different system. This is, why I invoked my FPGA-based Audio Workstation and started with algorithms for sound synthesis in VHDL. 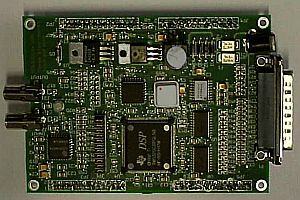 The DSP boards operate independently from each other and can be stacked in both directions (up/down and left/right) to create a versatile processor system with a true bus. It is also possible to link the boards in a subsequent way performing pipelined operation because interconnections are freely programmable in FPGAs. Depending on the desired functions, various operation modes of the synthesis module can be achieved. Regarding the wave generator, classical sound synthesis like SST and also VAM are possible. All sub modules like filters, oscillators and LFOs are interconnected via matrix operations which offers very complex routing options. The delay can be used for chorus, flange and stereo placing of the generated voice. The currently used FPGA operates at 16 MHz giving all the internal combinational logic enough time to operate correctly. Even with this low speed, the filters, which are of FIR-type and operate with 128 Taps sequentially can produce an output sample rate of 125kHz. At least 4-6 of such units are available in one FPGA. Using 64 Tap filters and focusing 48kHz, it is possible to operate fully pipelined and generate at least 4 channels / voices including wave generation, filtering and the feed back mixing. Using IIR-filters which are commonly used in virtual analog synthesizers, it is possible to generate 12 voices at 48kHz leading to around 50 complex voices in total. With the next generation FPGAs, like Spartan 3, it should be possible to run the same architecture with doubled speed and use 3 times re space in the FPGA, one module might serve 180 voices. A synthesis test with the Virtex 2 architecture for the largest available device already showed more than 160 voices for the same synthesizer topology and 120 for an assumed version with doubled complexity (6 filters, 8 LFOs per channel). Further progression can be achieved when optimizing the design for better pipelining. 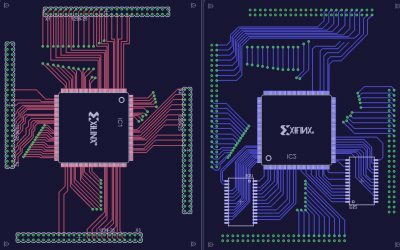 FPGAs typically run at lower speeds than DSPs when synthesis constraints are set that way that a balanced tradeoff between speed and area is focused where not too many additional FFs will have to be added in order to achieve the desired system frequency. Usually, this is about 3 times lower. On the other hand, FPGAs do process many operations within one single step where DSPs need 2 or more and thus come closer again to the DSPs in final data operation speed. However a ratio of 1:2 might persist at this point of view. But there is room for improvement: Because of full pipelined operation any residing clock cycle which is not required to complete the total number of operations of the channel which have to be done during one sample period can be used to generate more channels. Only a further set of variables / signals is required for this, so balancing the pipeline delay with the architecture width is required. Tweaking the internal architecture that way, that complex operations like filtering are done the parallel way, saves pipeline delay and latency and increases the used area only moderately, where doubling the number of voices in a DSP system requires up to the doubled operation frequency. For a synthesizer running on 24 MHz system speed, there is a theoretical pipeline budget of 500 clock cycles when focusing 48 kHz data speed. If the calculation pipeline uses 400 cycles to complete, 100 voices are possible. Partial architecture doubling rather than instantiating a second module might increase the used area by less than 100% but lower the delay down to 300 cycles leading to 200 possible voices. A DSP might still compare to this easily and process also 200 simple synthesizer voices like these. But increasing the DSPs system speed by 100% will lead to 400 voices "only" while a FPGA with 48MHz will produce 700 voices already. The higher the system speed, the greater is the advantage of the FPGA. Taking into account, that costs for FPGA area is about 3 to 8 times more expensive than equivalent DSP power, it is a question of time, when FPGAs will overcome DSPs making it possible to integrate more tricky features easily and maintaining the number of voices. Assuming more FPGA power being available in the future, thousands of voices will be available and make it possible to generate a lot of details of real acoustical instruments like a piano or a harp which have lots of strings with harmonics as well as many details of resonance in the wood. See my idea for an FPGA based piano. Apart from virtual analog modeling FPGAs can also be used to emulate real analog synthesis. For oscillators there is the possibility to make use of internal PLLs which are controlled by self running oscillators created in the FPGA which physically (not virtually) act. One approach was shown here: Oscillation the analog way.